I realize we haven’t posted anything the last few days but we’ve been very busy prepping for Thanksgiving. We will have lots of recipes and a few stories to share once the dust settles. In the meantime we want to wish ALL of you a very HAPPY AND SAFE THANKSGIVING HOLIDAY!! Enjoy your time with your family and loved ones. We are ever so thankful for you and the friendships we have formed. Thanks. It was great. 🙂 Love you, too. Thanks, Stefan. It was great! 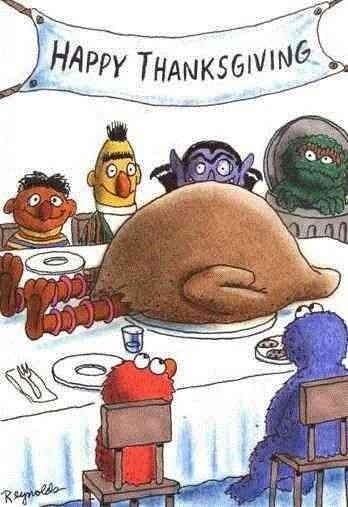 Poor Big Bird! Have a happy Thanksgiving. Thanks Reena. We hope you had a wonderful Thanksgiving, too. Ha ha, indeed! Happy thanksgiving and thanks for the laugh!